The following review is for a product called Keto AF Keto Super Fuel. This dietary supplement is designed to support increased blood ketone levels, athletic endurance, mental performance, sustained energy and fat burn. It combines ingredients that are known to be helpful in raising ketone levels for longer when they work together. The two chemicals, Beta-hydroxybutyrate (BHB) and Triglycerides (MCT) provide your body with energy and muscle growth improvement. Cinnamon helps prevent enzymes that block insulin receptors, which helps regulates blood sugar levels and burn fat in those that are already in the keto diet. Cinnamon also helps prevent inflammatory conditions that would damage cell membranes and insulin receptors. Dissolve one scoop in 8 ounces of water, almond milk, coconut milk or coffee, 15 to 30 minutes before exercise or in between meals. It should be taken in an empty stomach or whenever physical or mental performance are desired. Once tolerance has been assessed and you are looking for additional boost, take one scoop extra before training. It is very important that you do not exceed the recommended dose. Very high levels of triglycerides may cause heart, liver and pancreas problems. If you are under the age of 18, pregnant, breastfeeding, or have an existing medical condition, consult with your doctor before using this supplement. You can purchase this dietary supplement from the manufacturer through their website for $49.99, which is a 10% discounted price. It is also available from third-party retailers for $47.45 a bottle. On the manufacturer’s website, it is indicated that they offer 100% money-back guarantee, however, it is not mentioned how long it is. When we searched on one of the retailer’s websites we discovered that the money-back guarantee period is 30 days. This is not the best guarantee, but it is much better than nothing. Keto AF Keto Super Fuel could be beneficial in increasing ketone levels in the blood, enhancing performance, endurance and mental function. The manufacturer is confident that this product is effective, in that they offer you a 30-day money-back guarantee. It is good that there is a money-back guarantee because the customer will buy knowing that they can return it if they are unhappy. We like that there are some positive reviews about the supplement, which gives hope to consumers who want to buy it. However, there are also some critical reviews that one needs to keep in mind as they buy this product. Some consumers complained that the product did not put them into ketosis, while some complained about the taste. The price is a bit high compared to most of the keto products on the market. Lastly, the manufacturer states that you may increase the dose once tolerance has been assessed. However, we are worried that it might be too much for other people, and they might end up developing liver and/or pancreas problems caused by triglycerides. We suggest that you look for another product that has a longer money-back guarantee period, and one that has no side effects. 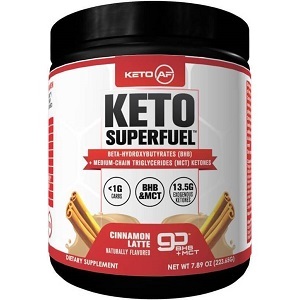 John Parker	reviewed Keto AF Keto Super Fuel	on August 13th	 and gave it a rating of 3.5.